Baseball and the Law: Cases and Materials explores the jurisprudence of baseball through 110 principal readings, 600 notes, and 26 photographs. After an introductory chapter that acquaints students with the sport and the role lawyers have played in its development, the authors proceed to examine a multitude of legal issues, from player salaries, franchise relocations, and steroids to fan safety, broadcast rights, and gambling. Special attention is paid to racial and sexual discrimination; tax planning, asset protection, and bankruptcy; and the burgeoning use of technology. A concluding chapter focuses on amateur and youth baseball. 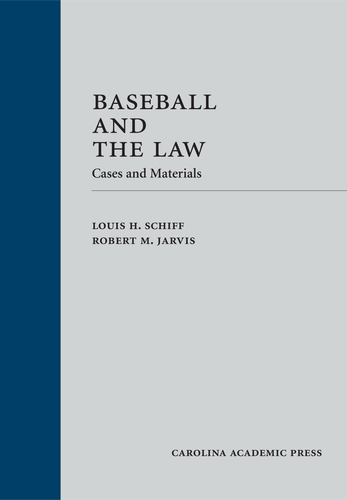 The book draws on a variety of materialsincluding court decisions, arbitration awards, law review articles, newspapers stories, and blog poststo place baseball in three different contexts: cultural, historical, and legal. The exhaustive notes make numerous references to movies, TV shows, and videos to further demonstrate the connection between baseball and the law. In addition to being a fun read, this work will strengthen a students understanding of such core subjects as civil procedure, constitutional law, property, and torts while improving his or her ability to read contracts and parse statutes.